The Cannonvale represents a sense of grandeur. The heavy timber double doors open to welcome you into the main living area of the home. This home has been designed to suit a family with growing teenagers. 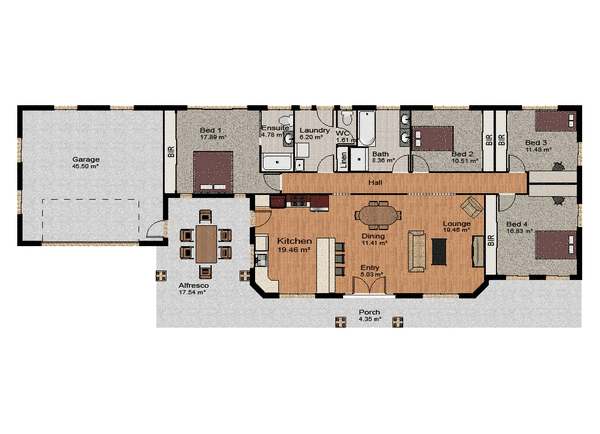 All the bedrooms are separated from the main living area to give privacy to everyone. Bedrooms 3 and 4 have built in robes and study desks. The main bedroom has a built in robe and an en-suite with an extra large shower. The double garage easily accommodates the 2 family cars. This is a well appointed home satisfying a wide varity of needs and wants.